Running a successful field service organization today requires technology that provides a real-time visibility into the status reporting of those working in the field, and parts availability and location. For many, making this happen still requires an investment in technologies and their integration. However, even while we are working with customers and prospects in this regard, the latest innovation is coming in the form of wearables. Sales of wearables are expected to be around $100 million this year (and could reach $19bn by 2019), but their use in field service organizations today is minimal. Increasing field productivity is not only driven by improving drive times and optimizing travel routes, and performing real-time optimization of schedules and parts availability, but also through making onsite time as efficient and effective as possible. ServicePower focuses on all these aspects of productivity already – and we recently published a White Paper that outlines some of the differing approaches involved in creating and managing optimized schedules – therefore we naturally see the opportunity for wearables to complement the power of our software. Gartner comments that come 2017, Smartglasses may save the field service industry $1 billion a year. Even though we are seeing demand for photo and video capture technology as part of triage, knowledge or evidence management, and added efficiency, that estimate does seems somewhat aggressive. There are concerns about security and privacy related to Smartglasses that will take some time to work through therefore the early adoption of this wearable technology remains low. In the meantime however, we are enhancing our mobile product – ServiceMobility – to accommodate many of the future features of Smartglasses including natural adaptability to incorporate data from Google glass or other sources. Watches are one example of a growing wearable technology that could have more rapid adoption by field service organizations. 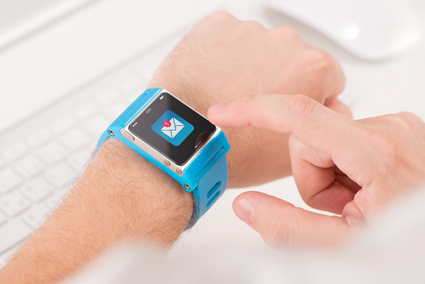 Following in the footsteps of Salesforce who released their API in June 2014 to enable business apps to be built for wearable technology, ServicePower can expose status reporting and other APIs that can be used with a watch. Not only is this very practical but it also drives added efficiency and productivity of the field teams. There may be status reporting or pre-triaged parts information that could be updated easily - and most importantly, in real-time – in the field by a technician, adjuster, home healthcare worker or any other mobile worker. In this case, an emerging technology like technology-enabled watches, is an obvious enabler of the real-time adoption of technology that is needed for organizations to become increasingly efficient and communicative. The Apple Watch hits the stores in early 2015. LG and Motorola already have products out. At ServicePower, we clearly believe that the basics for a 2015 smartwatch strategy is to adopt this technology for real-time status reporting, access to selected job information, activity reporting and – potentially – the ability to place “instant help” calls to an expert. Forms, parts schematics and other more detailed aspects of life in the field will remain better suited to tablets or laptops. Watches however will certainly be an interesting complement or replacement for certain functions that are otherwise handled today by a larger device. Having a field worker use a smart watch is also more practical in tight workplaces or where there is much to carry. ServicePower also recommends looking at the means of photo and video capture, even if adoption of Smartglasses may need somewhat more time to mature. And for those that don’t have the capability to see real-time parts availability as part of your service strategy, put that (and a smartwatch!) on your New Year’s resolutions. In 2015 high-performing field service organizations need both real-time status reporting and parts availability to meet customer expectations at the same time as meeting productivity and cost goals. To schedule a meeting at CES click here, and watch next month for a webinar invitation to hear ServicePower’s CTO Steve Higgins talk more about wearables. An experienced leader in financial management and business growth, Marne exemplifies operational leadership, including demonstrated skills in restructuring and IPO's on an international level. Previously, Marne was CFO at Norcon plc, an Isle of Man based telecom where she conducted an IPO and was responsible for all public market and shareholder relations. Prior to Norcon, she was President at East West Resources Corporation, where she drove efforts to launch GSM licenses in the Americas while pursuing M&A opportunities across various industries. She was also President of Digicel Holdings, Ltd, a Central American telecom firm where she launched operations and oversaw general management. Marne has a BSFS from Georgetown University in Washington, D.C., as well as a MBA/MIM from ESCP Europe and Krannert School of Management. She is an active equestrian and past President of the Potomac Valley Dressage Association. Marne joined ServicePower in January 2013.